Once. It’s all the time required to recognize the creative energy of Susan Moses. Big hair, big purse and big generous smile all enter the room with her, anchored by two decades of fashion experience steeped in the culture, from the Hollywood big screen to high-end SoHo boutiques, and through work on more than 50 music videos and numerous ad campaigns. If, like other professions, letters were placed behind one’s name, Susan’s business card would be filled to overflowing. Throughout her admirable career Susan has been called visual merchandiser, dresser, model, stylist, editor, blogger and spokesperson. It’s a career best described as epic. And it’s still growing. In 2013, Pennington’s, Canada’s premiere retailer, known as the “destination store for plus-size women” contracted Susan to serve as their exclusive spokesperson. In this capacity, she comes from behind-the-scenes to bring a first class Hollywood fashion experience to a seven city styling tour where she will introduce the seasons trends, meet and greet customers and offer some major style tips. Additionally, she will be featured in Pennington’s online “How To Wear” videos, represent the brand at media events and work internally with Pennington’s executive management team. This year also sees Susan launching a new collection of contemporary fashions addressing the real proportions of plus-size women and celebrating their curves with modern silhouettes and glamorous sophistication. In a world of one-hit wonders, throwaway everything and instant anything it takes a special person to rise this high above the fray. 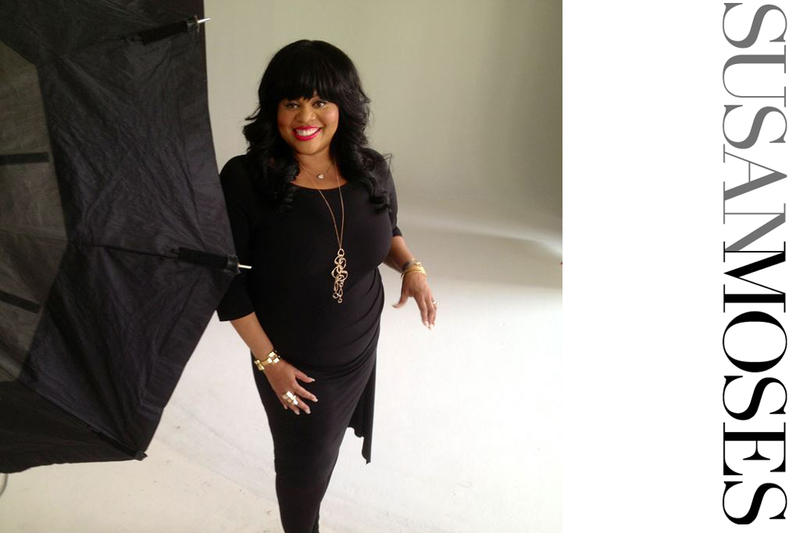 Susan has been embraced and held high by Hip-Hop, Nashville, Hollywood, Neo Soul, Pop and R&B royalty. Her styling talent has been showcased on red carpets and stages from the Oscar’s to the Golden Globes, from the Grammy’s to the American Music Awards, and all the alphabet events (BET, MTV, Vh1 and SAG), in print and television advertising and on late-night and daytime talk shows. Like most experts, Susan has a formula and a format. When preparing to create fabulous fashion, she first mixes her mom’s house rules of good undergarments and good shoes with a dose of old Hollywood glamour—think Mildred Pierce, Gentlemen Prefer Blondes and How To Marry A Millionaire—and Black diva fierceness taken from any Pam Grier Foxy Brown film and Diana Ross’ iconic Mahogany. Then she sprays on a little “Coco Mademoiselle” by Chanel, throws on some real good music of any genre, and things begin to happen. Long before Susan’s phone started blowing up with requests from the handlers of the original Destiny’s child, Brittany Spears, Da Brat and Hillary Duff, she was honing her skills at La Rue de Reves, a New York City boutique, where her sense of style was quickly recognized; and to her advantage, quickly exploited. Here she was allowed full expression. She handled in-store visual merchandising, co-produced and modeled in the store’s fashion shows, encouraged and developed merchandising for women who wore double digits and became the boutique’s personal shopper for that demographic. Word got out about Susan. Soon she was pulling wardrobe for the hit show, Star Search, merchandising windows throughout the fledgling SoHo district and working on seasonal fashion shows for Carolyne Roehm, Oscar de la Renta protégé turned fashion icon. It was the luxury of the Roehm environment—the use of House of Lesage jeweled embellishments, the highest quality textiles and intricate couture details—that had a profound effect on Susan’s love of fashion, her ultimate styling signature and her arrival to the status of fashion designer. Roehm, was once quoted in Salt Lake City’s Deseret News as saying, “My tastes run more to the simple silhouette that emphasizes the woman not the dress.” Though she may not have said these words to Susan, through sheer osmosis this fashion philosophy has shown up on Susan’s clients from teen idols to beloved legends. In the early 90s the African American lifestyle magazine, Shade, debuted with Susan as fashion editor. On its pages is where she fused all of her experience and resources and connected all of her artistic dots. For the first time Susan’s creativity was being documented with photography. Readers, as well as fashion and entertainment industry decision makers, were watching her talents unfold through the development of her fashion stories. The floodgates opened. It started with Brandy, the hot R&B star of the moment, and was quickly followed by a slew of male and female artists—Jagged Edge, 702, Adina Howard, Usher, Tyrese, Ray J, Angie Stone, Kelly Price and Da Brat among them. There were a lot of record labels then, and all of them were calling. In the midst of a career moving faster than the Concorde, Susan was asked to be Brandy’s personal costumer for UPN’s number one show, “Moesha.” Susan established a second home in Los Angeles, became a member of Local 705, the costumer’s union, and remained with Brandy for six successful seasons. Getting in on a good thing is what many want, and Susan Moses is a good thing. In the new millennium, bolstered by Academy Award and Golden Globe nominations, and a star that was sure to rise, Queen Latifah—who had been dressed by Susan in the past for a Brandy video and a Mode cover—called on Susan to join her glam squad. In addition to styling Queen Latifah for every major award show, magazine features, album covers, Covergirl commercials and campaigns, and all public appearances, Susan also served as her personal costumer for five films and was the creative director and co-designer of Curvation, an apparel line inspired by the rapper-turned-actor. Styling curvy celebrities and models for magazines, television, and red carpets, contributing editor positions at Mode and Figure magazines, spokeswoman status for the intimate apparel company, Just My Size, and serving as the official fashion blogger for Sonsiliving.com, solidified Susan’s reputation as a fashion authority. In 2011 her expertise was acknowledged with the presentation of the Fashion Stylist of the Year award during Full Figure Fashion Week. By the masses, Susan is known for the tasteful, flattering, and on occasion, brazen wardrobe styling she creates for marquis names. But in the industry, it’s her flawless work ethic that precedes her and has made her the one to want, when you want it done right with no nonsense. It is this quality and her fashion skill set that drives the career that has taken her from sales girl to star stylist. In a business where everyone in it is now known as a celebrity, Susan celebrates the art of fashion and nothing more. She is clear that trends will come and go, but fashion will always be here. Susan did not set out to become the curator of curvy fashion. It just happened, and it’s happening big. Guess you can call it epic.